With unrivalled technical excellence, design, aesthetics and performance, Real Cinema goes far beyond traditional standards. 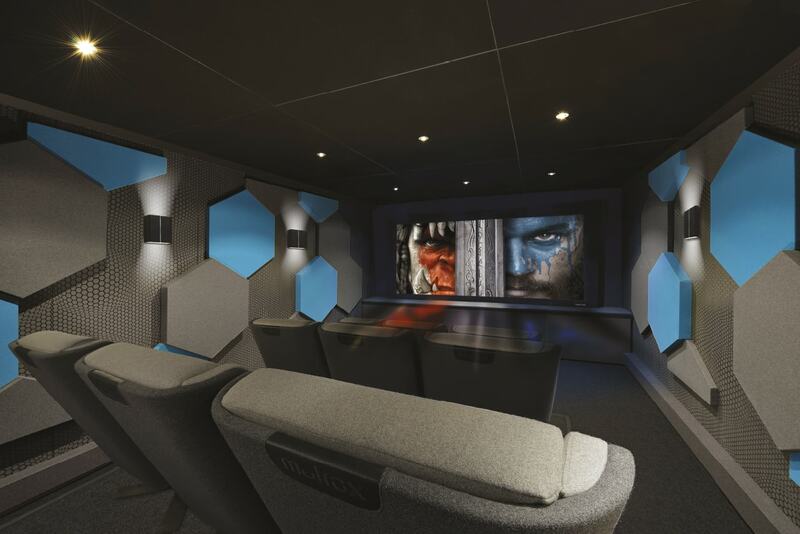 The advantages of new 3D Cinema Sound formats comprise of three main aspects: overhead sound, improved audio quality and greater spatial control and resolution. Overhead sound adds realism. Furthermore equal sound pressure levels for all channels with full frequency response improve the overall sound quality. Being able to position specific discrete sounds in addition to ambient sound in the environment adds a heightened sense of realism. The increased surround resolution creates opportunities to utilize sound in a room-centric way which better supports the on-screen action. In the design process of a reference theater the room ratios are fundamentally important for the optimal sound distribution in the room. Serious sound reproduction problems like standing waves can be minimalized and better controlled. The ISE theater ratios: 0,67x1x1,55. 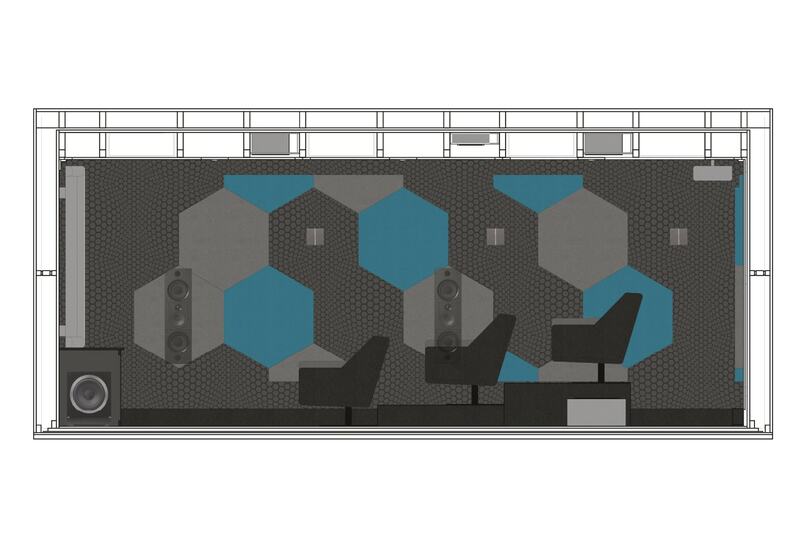 Real Cinema is equipped for 3D sound formats with optimized positioning of speakers in three layers to avoid acousticholes in the soundstage. As standard the angle between the top and low layered speakers, is between 30 – 55 degrees. Reflections can cause comb-filtering: when a sound is slightly delayed and arrives a few milliseconds later in comparison to the direct signal, constructive and destructive interference occurs. This can be caused by a nearby reflective surface off which the sound bounces. In the Real Cinema reflections are either absorbed or diffused to achieve an optimal sound reproduction. Related to the volume of the cinema, a reverberation time of 0.45 at 500hz has been implemented, to safeguard a pleasant cinema experience. This reverberation time is not linear across the total frequency band. A proper cinema experience dictates a ‘S’ curve in the total spectrum. In the lower frequencies the reverberation is higher and in the high frequencies lower. 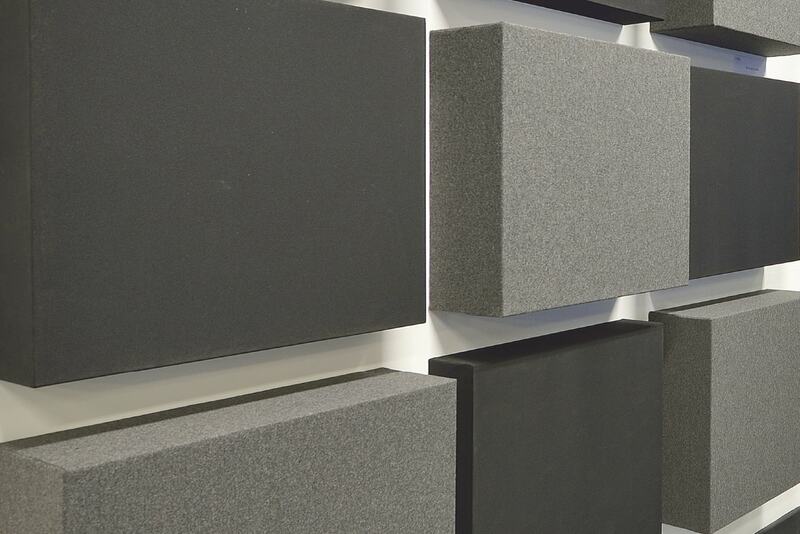 The reference CI800 Series speakers have been fully constructed into a baffle wall to avoid backwall cancellation, allowing the loudspeakers to be driven to their optimum level of performance. The honeycomb shaped “hives absorbers” have a different thickness (40, 80mm) and in conjunction with the side and back-wall they work according to a quadratic formula as residual diffuser, to take care of first reflections and flutter. They also effectively cover the side CI800 speakers blending them into the harmonic design. The cinema measures an isolation value of 55 dB(A) which minimizes environmental background noise, resulting in great definition and audible silence in recordings. The isolation value was accomplished by creating a 12000 kg box in box construction, with an internally double decoupled springs system. In the Real Cinema 4 Bowers & Wilkins subwoofers are optimally configured with acoustical bass management along with Mutrox bass resonators. 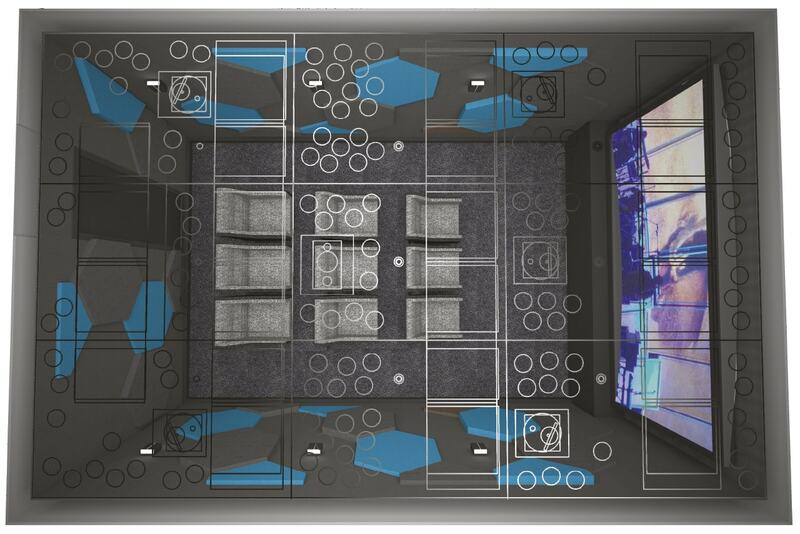 Multiple subwoofers can reinforce each others bass response and will yield a significantly smoother and more dynamic LFE sound, everywhere in the room. In relative small theaters proper bass management would take up an enormous space. In this theater the bass chunks (20 in total) are placed above the ceiling and absorb broad banded low frequencies. The resulting bass extension radiates control, power and speed. The ceiling itself has been randomly perforated in a diffused pattern with different sized holes to diffuse frequencies above 400Hz and avoid unwanted reflections (comb filtering). 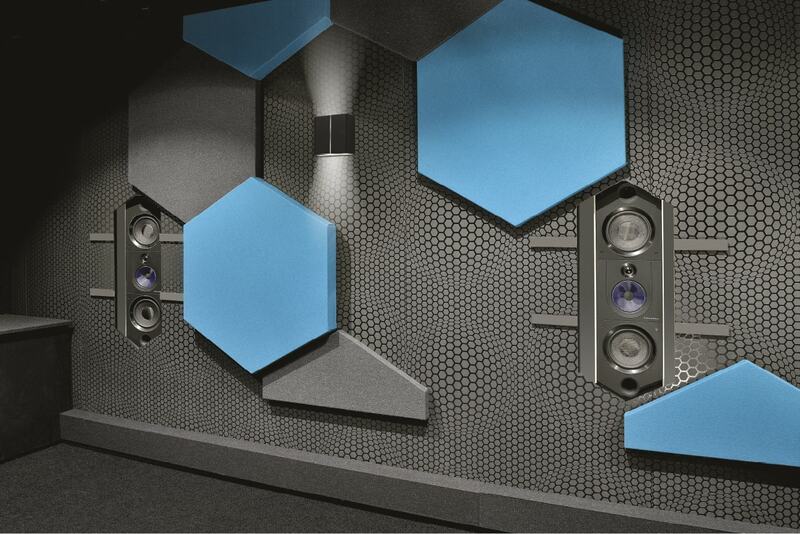 In this execution of Real Cinema a Mutrox Acoustic SpringFloor System has been implemented. This new invention is a reverberating stage floor which is only powered by the subwoofers in the room. The system works via the natural energy of low frequencies, which are produced by the subwoofers. The cavity underneath the stage absorbs the low frequency energy and sets the stage in motion due to a calculated, internal spring system. The result is stunning, a lifelike and natural reverberation while watching film or music.